I left off last week with a few problems. The second LED array would not go all the way off and after some troubleshooting this week I realized that the circuit was not working properly due to a faulty n-channel MOSFET. This was probably caused by the odd way I was powering up the third 555 in the circuit. 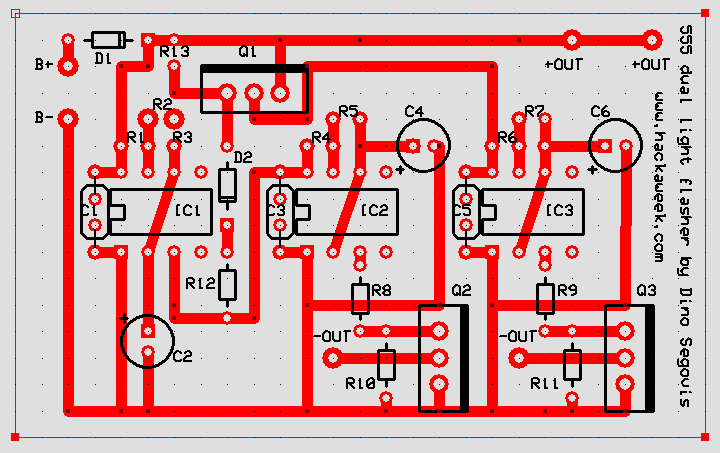 After abandoning the idea of using a small switching transistor to turn on the third 555 an idea hit me. Why not use a p-channel MOSFET? When pin 3 of the first 555 goes low I could utilize the ground signal from that pin to pull the gate of the p-channel MOSFET (Q3) to ground thus turning it on which would allow voltage to flow from the positive rail through the MOSFET to pin 8 of the third 555. I tested it out first on a breadboard and it worked fine so I added it to the schematic and installed it on the perfboard. The operation of the circuit is as follows. All three 555s are configured as astable oscillators. The first 555 is set to cycle high for .1 to 1 second depending on the position of R2 potentiometer. The positive output from pin 3 goes to the second 555 which powers it up. It then oscillates at approximately 40 21 hz on pin 3 and feeds a positive voltage to the gate of the n-channel MOSFET (Q1) which turns it on and off rapidly thus supplying a ground to the first LED array. When pin 3 goes low on the first 555 the ground signal pulls the gate of the p-channel MOSFET (Q3) to ground and turns it on which feeds a positive voltage to the third 555. This 555 then oscillates a 40 21 hz on pin 3 and feeds a positive voltage to the gate of the second n-channel MOSFET (Q2) which turns it on and off rapidly thus supplying a ground to a second LED array. The result is an alternate rapid flashing of two LED arrays with adjustability in the rate via the R2 20K potentiometer. This circuit could also drive other lights providing the load does not exceed the amperage rating of the n-channel MOSFETS. 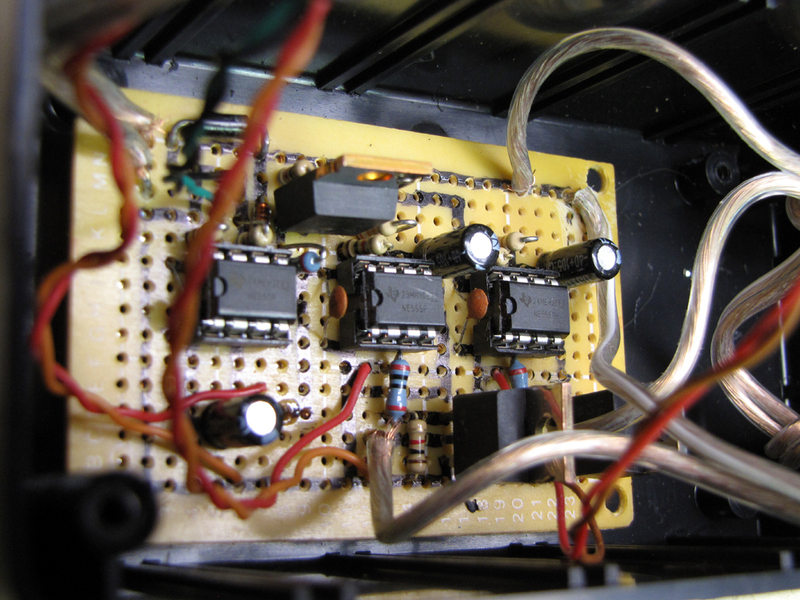 It could also be modified to run other devices such as relays or stepper motors. Of course, all of this could be done with a micro controller but I chose the 555 because the design and build of the circuit is a good teaching tool for those wanting to learn beginning electronics. Below you’ll find a parts list, link to parts suppliers, a PCB layout, the schematic and the final build video. UPDATE: See Timo’s comment below for an alternative circuit. Amazing project. Built my own and tried following the gremlins myself. could you do us a favor and post your trace layout as well? Love the videos, Keep on hackin! Done! There’s a .jpg file and the ExpressPCB layout zip file now uploaded. Was that black&white schematic created in ExpressPCB? Looks very clean. I like it. In the photo of your perfboard, it looks like a few copper strands of the wire (with the clear insulation) at the bottom are wandering over to the blue resistor. Maybe it isn’t an issue, but I thought I’d point it out. Your board might benefit from some connectors. … top left wire, same thing. It’s OK it’s not touching or it wouldn’t work. :)The one in the upper left is connected to that diode. First of all, please DON’T LEAVE THE !RESET FLOATING! 😀 It’s like driving around in a car in which you connect the battery by winding the wire around it. You have to connect it to Vcc. Even better, start and stop the 555 with the reset line and leave the Vcc of the 555 connected. That’s the correct way to start/stop a 555. This way the power supply for the IC stay’s clean. But never ever leave a reset (of !reset) pin floating! You use a zener diode but you can use a normal cheap 1n4148 as wel. You only use the zener effect if you connect the anode to the negative side and the kathode to the positive side. To use the zener effect you connect a zener the other way around then a normale diode. This way it’s just a diode. The square on top of the output without diode is because the 555 will source current to the PMOS. And the output of the 555 isn’t very stable under load. Because of the diode you force the PMOS to get all of the current needed to shut off by R13. If you want to use this schematic I would swap the PMOS with a PNP. You don’t need a bit and expensive PMOS. And like I said, because of the charging the C with R1 + R2 + R3 and discharging with only R2 + R3 you don’t have 50% duty cycle. When turned up to the highest frequency, R2 = 0 and the duty cycle is 66%. I can see the difference of the two flashers on camera. That’s why I made a different circuit, the 555 with fixed 50% duty. That’s done by charging and discharging the C with the output instead of Vcc and the discharge pin. 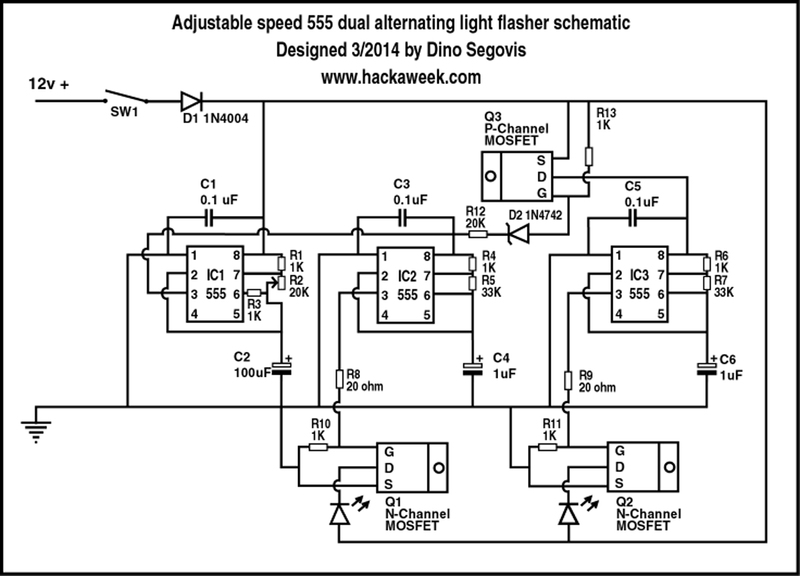 I also made a alternative circuit based on Dino’s which combines the second and third 555. Because why make the same thing twice when you just use one at a time? You need a lot less components this way. With R1 you can change the rate at which flasher 1 and flasher 2 alternate and with R2 you change the fast flash rate of both flasher. You can use a pot + resistor and make it variable. If you use a 22k pot and a 1k8 resistor in series for R1 you can change the alternating rate between 0,3Hz and 4Hz. And for R2, if you use a 33k pot with a 33k resistor in series, you can change the flash rate between 10,9Hz and 21,9Hz. This way you have two variables!